FOXBusiness.com’s Serena Elavia talks to Love Your Melon for Power Millennials on their commitment to battling cancer. In 2012, while they were students at the University of St. Thomas in Minnesota, Zach Quinn and Brian Keller developed the idea for Love Your Melon (LYM). It happened during an entrepreneurship class, where Quinn said they “broke all of the rules” and ran with the idea. At first, the idea was to put a hat on the head of every child in America suffering from cancer. They followed the Toms Shoes model of buy one, give one. But four years after its creation, LYM has expanded into a full apparel and accessories line selling shirts, koozies and scarves. “So when we’d sell out of hats people would still want to support us in other ways. And so we started expanding the line so we could have more quantity of products available” says Quinn, a co-founder of LYM. Now LYM has blossomed from a start-up to a powerful force in fighting cancer. LYM has donated $500,000 to cancer research to date and has seen 600% growth year over year. They’ve even built up a tremendous celebrity following with celebs like Jessica Simpson, Ashton Kutcher and Mila Kunis wearing their hats. And in 2014, LYM launched its campus ambassadors program, now consisting of over 11,000 ambassadors on 740 ambassadors. 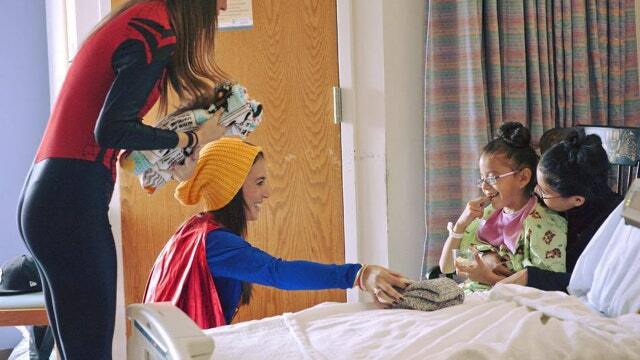 One of the activities that campus ambassadors do is Superhero Day, where ambassadors dress up as various superheroes and visit local hospitals, meeting with young cancer patients and passing out hats. Quinn also stressed the importance of having their products be made in America from the start of LYM. Currently, they’re working with manufacturers across the country to meet demand for their products. “If we’re donating hats here, if we’re selling hats here, we better be making them here because it’s a community style thing” says Quinn. Quinn says the key to being a successful entrepreneur is organization. At one point, he said that LYM was operating out of a car, an office and an apartment before consolidating into one space and making his and Keller’s life easier. And while it might feel like taking a big step, Quinn encourages his fellow millennials to take the risk of venturing into uncharted waters when launching a business. “We’re trying to present this opportunity to other college students that I believe can be inspired to do great things as well. Whether it’s be a part of Love Your Melon or start their own thing, these possibilities are out there as long as you give it a shot and try it” says Quinn. This is the first in FOXBusiness.com’s four-part series on ‘Power Millennials’. Next Wednesday we feature Market Snacks, a millennial run financial newsletter.